There are times that I think that I am stuck in a time warp. Although I find myself thinking about what the future holds, I spend a lot of time thinking about what has happened in the past. I guess one could say that I like to reflect on where I’ve been and where I’m going. I suppose that’s true. As we wrap up another school year and my third year as an instructional technology coach, I have a lot to reflect upon. I started this job with a few instructions on things that would need to happen in our district, but I did not have any idea of where to go to get answers. Lucky for me, there were two of us hired to serve as instructional technology coaches in the district. My colleague and now friend, Robin Harris, felt the same way I did. We were just a little lost that first year. However, things changed for us. Two weeks after I got hired, I was in Atlanta at the ISTE Conference (International Society for Technology in Education). Talk about brain overload! That fall, we went to GaETC and presented. I think that’s where the shift started. 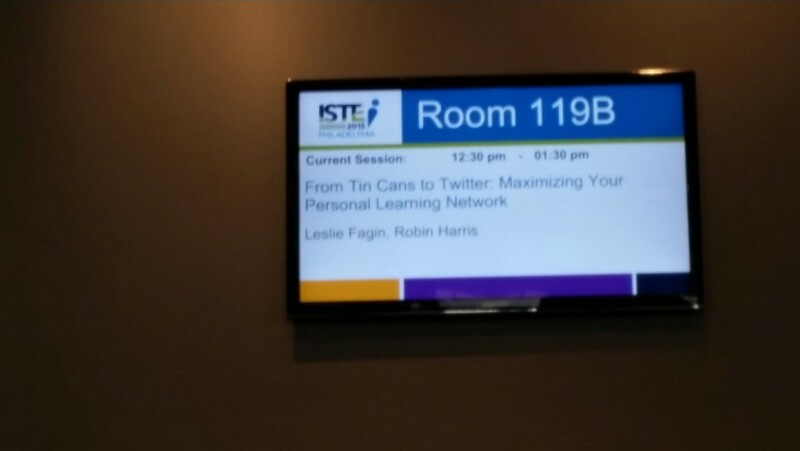 Our session was entitled, “From Tin Cans to Twitter: Maximizing Your Personal Learning Network”. We talked about Twitter, Voxer, and Google+. People listened, and we started making connections with people across the state and region. As my circle grew, so did my level of knowledge. I began reaching out to others to get and share information. I took advantage of my ISTE membership and joined the online communities, started lurking in Twitter chats, and stumbled upon #Edumatch. Realizing the power of being a connected educator, I attended a few edcamps and actually contributed to some Twitter chats. Oh my goodness! Who ever knew that there was so much useful knowledge out there on social media? Fast forward to May 2017… I was recently named the ISTE EdTech Coaches PLN Award Winner for 2017. I co-authored #EduMatch: Snapshot in Education 2016 with 19 other phenomenal educators from around the globe. 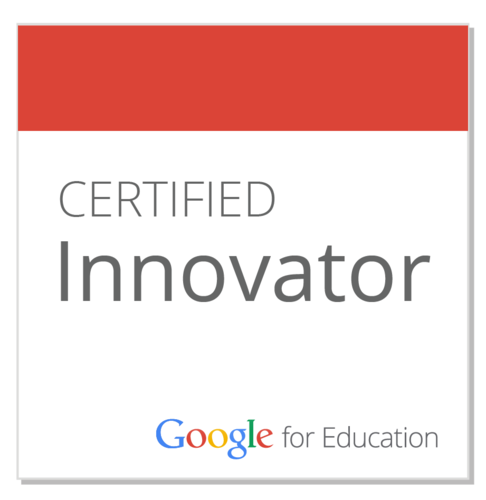 I have presented at ISTE 15, ISTE 16, GAFE California Summit, GaETC 2014, GaETC 2015, GaETC 2016, G Suite for Education Southern Summit, and was selected to attend the Google Geo Teachers Institute in 2016. Oftentimes I am participating in #Edumatch Tweet and Talks discussing important topics in education and moderating Twitter chats book studies, and I am currently in the process of writing my own book which will be released in 2018. All this is possible because of the connections I made via social media. I would love to see more educators connect via social media. Amazing things can happen. My part in making connections will continue to happen as I move forward into the fourth year of my job as an instructional technology coach. I am excited to participate in the ISTE #ETCoaches Blogging Buddies project. I am part of a group of educators who have committed to blogging at least once a month and commenting on the blogs of the people in my group. My group consists of Katie Siemer, Tara Helkowski,Rahila Mukaddam, and Knikole Taylor. I am looking forward to this blogging journey with these ladies. So many good things have already happened as a result of my connections on social media. I cannot even begin to imagine what will happen once we get going. Having a group of people to help hold me accountable will no doubt help me improve my craft. It will be nice to be a cheerleader for them and for them to cheer me on. We all need people in our corner to be there for us. I see these ladies being part of my #edtechvillage. Let the journey begin! The year I turned 30, I decided I would go on a trip every single month for the year. It did not have to be a huge trip, but I had to get out and see stuff. I felt like 30 was a big deal, so I needed to do it big. In retrospect, I had gotten complacent with what I was doing, and I wanted more. Wanting more seems to be a recurring theme in my life. Almost 17 years later, I still want more. My plans to go somewhere every month took off. I went to North Carolina to ski and hike with friends, Gatlinburg for a singles conference, Mobile for a work conference, Alabama for a singles conference (yes, I am still single even though I spent a lot of time at singles conferences), Ohio for my grandfather’s funeral (not really a vacation, but I counted it anyway), and the Grand Canyon which included stops in Washington, DC, Chicago, and New Orleans. Not long after I returned from the Grand Canyon, I started to pursue employment opportunities that would take me away from my home in Griffin, GA. I interviewed for a job in Lake Jackson, Texas and decided that was not the place for me. I next applied for a job in San Jose, California. Every since I was a little girl, I wanted to live in California. I remember watching the shows from the ’70’s, CHIPS and Charlie’s Angels especially, and I imagined myself living, working, and playing near the beach. Moving 3,000 miles across the country based on childhood dreams seemed like a perfectly logical thing to do. I applied for the job, had a phone interview, and was invited to meet with the executives while in Kansas City, Missouri while at the National Girl Scout Council meeting. Based on the interview, I was convinced I would not be offered a job. I was wrong. At the end of October, I received a phone call asking me to come work for the Girl Scouts of Santa Clara County Council. I accepted the job and began the process of leaving one job, my family, and my whole life to start anew in California. I did not know anybody. I did not have a place to live. I had not even seen my office. Other than what I saw on the internet, I had no idea what I was getting into by moving to San Jose. However, I stepped out on faith. On Saturday, November 27, 1999, I put my little red Hyundai Accent in reverse, backed out of my parents driveway, and headed out west towards new dreams, opportunities, and challenges. Going to California was the best and worst thing I could have done for myself. I ended up only staying in California for 7 months. The week after I left, my mother was diagnosed with cancer. A month later, we found out it was terminal. I came home because I wanted to be with my mother as she lived the last days of her life. Although I wanted to come home immediately, my parents convinced me to stay until July. I did, and I am glad I followed their advice. I needed to leave home. I needed to step out of my comfort zone. I needed to know that I could do what others said I couldn’t. Moving to California would mean that I had finally arrived, albeit a few years late, to adulthood. I feel the same way now. I have been an instructional technology coach for nearly two years. I have done a lot of training sessions with teachers, presented at numerous local, state, and international conferences, and maintained somewhat of an online presence, yet I am finally at the point where I feel like I am actually coaching. I can’t put a word to what I would call what I have been doing, but now I am coaching. I am helping a school as they pilot a 1:1 Chromebook rollout. My job entails working with two teachers as they transition to a more deliberate and focused use of technology on a daily basis. This feels more like coaching than what I have been doing for the past two years. In my coaching sessions, I am sharing with them what and how to implement SAMR. We will examine data, create rigorous lesson plans, engage (hopefully) the students, and see positive academic growth. I will model lessons for the teachers. I am excited about the direction in which my coaching is heading. I guess I can say that I have almost arrived at being a real live instructional technology coach. Finally. I suppose that just like the day I left home and headed to California not knowing what I was getting into, I have no idea how this will turn out. That’s not even really an issue at this point because I have to prove to myself that I am capable of being not just an instructional technology coach, but a darn good one. I am all about challenges and accomplishing goals. I think that all of the jobs I’ve had prepared me for this moment in my career. It’s time for me to take what I have learned and what I have done and do more. Doing more will challenge me and show me what I am made of. I am long past the year I turned 30, but I still need to step out of my comfort zone and have some excitement, incredible learning experiences, and a reason to keep striving for the next set of goals. I remember learning about anticipation in two ways. The first was watching tv. Heinz had amazing commercials. I could sympathize with the characters in the commercials. Waiting for the ketchup to slowly drip out of the bottle and onto my burger or hotdog was excruciating when I was hungry. It seemed to take forever for the ketchup to end up on my food so I could eat. I also learned about anticipation every year on the night before the first day of school. I could never sleep because I was so anxious to get my year started. I was a good student and never really had trouble in school until 9th grade algebra, so I’m not sure why I was so anxious. I guess I just wanted to get started and hated the wait. I still hate waiting. Not much has changed since I started school in the ’70’s. I want my ketchup on my food in a hurry, and I want school to get started yesterday. I have been to the ISTE conference (International Society for Technology in Education) twice. Last year I had no idea what to expect, and I spent most of my time being overwhelmed. I was a brand new instructional technology coach, and I was at the biggest ed tech conference in the world. Although I was overwhelmed, I felt lost when it was over. I did not make many personal connections while I was there just because I was too afraid to speak to others. I have been shy since I was born, and that has not changed in the years since. I went to the Exhibit Hall and spoke to vendors. I remember a little about that experience, but since I was new and did not really know the overall technology plan for our district, I did not know where to focus my attention. I also went to sessions, but there was not an organized plan. I just went to the ones that caught my attention. After I got home, I could not figure out what I had accomplished. I did know that I wanted to go again, but this time I wanted to be more involved. I did not want to feel like I was a spectator. I wanted to be an active participant and contributor. Because I wanted to be more involved, I submitted two presentation proposals. The first was a BYOD with my colleague Robin Harris and the second was an Ignite session. Both proposals were accepted. I was over the top excited. Actually, I cried the night I got word that the BYOD proposal was accepted. I could not believe that I would be presenting at a national conference. I could not believe that I, Leslie Fagin, was going to be an active contributor at the very same conference that had overwhelmed me the year before. Seeing my name above the door was very surreal. I felt like I had arrived. 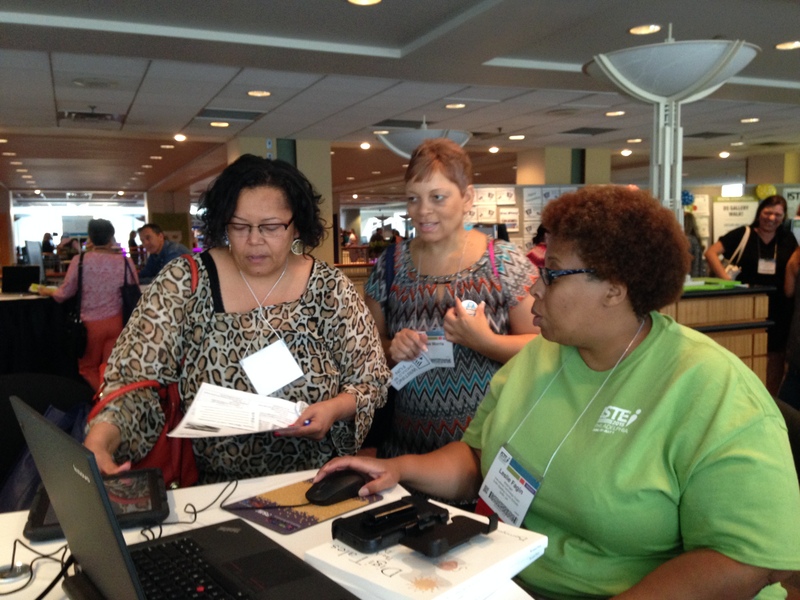 Preparing for ISTE became an integral part of all I did at my job. I wanted to make sure that I was more of a connected educator. I reached out on Google+, Twitter, and Voxer. I wanted to interact with others before I arrived in Philadelphia. Every day was one day closer to ISTE. I read, made plans, worked on presentations, and dreamed about my debut of sorts at ISTE. In my mind, I was going to do a fabulous job of presenting and become an instant ed tech sensation. I am at home now. I am not an ed tech sensation, yet I am not the same person I was before I left. One presentation went well and one went not-so-well. I connected face-to-face with friends made via social media. I connected with people in the Digital Storytelling Network Playground. Sharing knowledge in the playground was enlightening and validating for me. I’d like to do more of that both here and at other conferences. There are some other things I would like to work on before I go to Denver. Just like last year, I am already anticipating next year. However, unlike last year, I will not have unrealistic expectations. I will be an active contributor at the conference. I will maintain the connections I made in Philadelphia and via social media. Hard at work in the Digital Storytelling Network Playground at ISTE. I know what I need to do, and I will do it. There is that same sense of anticipation I had while waiting for the ketchup, school to start, and ISTE 2015 to get here. Oddly enough, as I pen this blog posting, there is a Rocky marathon on TV. I’ve seen all six movies, yet I watch anyway. I watch partly because I just came from Philadelphia, and I like feeling connected to the City, and also because I totally get how Rocky felt each time he stepped into the ring. He anticipated greatness. Even when Clubber Lang knocked him out, and he lost the fight, he got back up to fight another fight. I wasn’t knocked out, but I did feel I didn’t accomplish all I set out to do. Next year will be different. During Christmas vacation, I had the opportunity to have breakfast with two former students. I was touched when I received a text message that Thursday evening asking me if I had time to meet for breakfast the next morning. In the six months or so since I haven’t been teaching, I have felt forgotten about as a teacher. That makes no sense since I chose to not be a teacher anymore. I suppose I feel like I am not a teacher, and I don’t make a difference anymore. Crazy, I know. Anyway, I met Cody and Paige for breakfast. We ate, talked, laughed, and talked some more. They are both freshmen in college. We talked about their classes, their friends, their hopes, and their dreams. It was nice to sit down and enjoy them as grownups even though they are still kids to me. While at the restaurant, I had the opportunity to see another former student. He goes to college at Oral Roberts University and was home for Christmas. We didn’t chat much because he was working. I asked him to stop by my office before he left town to return for his last year of college. Monday afternoon came, Zay came by. He is the student body president at Oral Roberts University. He was the sophomore, junior, and student body president at our school. 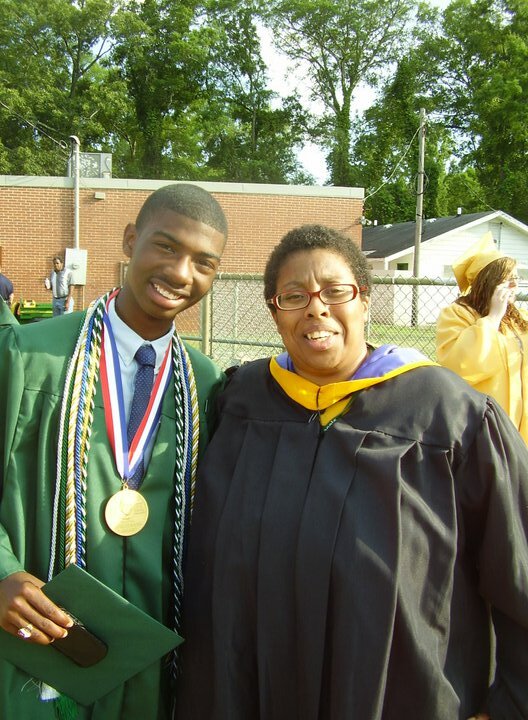 He was captain of our debate team, and a leader in several other student organizations. The fact that he has been a success in college is not really a surprise. He is about one of the most determined students I have ever met. If he says he is going to do something, he does it. Our visit was a good one. Since he graduated, we really had not had time to talk. Because he is so far from home, he is only home two times a year. He comes home for Christmas, and he comes home for summer. While he is home, he is working to earn money for school. He is a busy young man. We had a really good talk. Just like I enjoyed speaking with Cody and Paige, I enjoyed speaking with Zay. That night, I realized that my time impacting students is really over. The ones I had are finishing high school this year and will be in college next year. I spent a lot of time wondering if I was okay with knowing moments like those were over for me. I am getting okay with it because I still have students. Some of my students are older than I am, but they are my students nevertheless. I am teaching teachers how to use technology. The relationship is different from the one I had with my students, but there is still a student/teacher relationship. I am giving them knowledge that they can use to impact their students, increase their professional learning, and connect with educators across the globe. To me, those are all good things. I also know that I can have moments like that with the teachers. Since I have started this job, I have done several training sessions on Google, Mimio, Digital Citizenship, and Safari Montage. Robin and I also send out a newsletter every Tuesday, Tuesday Tech Tips. Without fail, I will get an email from a teacher saying that they found a useful tip in the newsletter, and they can’t wait to try it out. I remember the day I was in Wal-Mart, and I ran into one of the math coaches for one of our high schools. She was so excited about Hour of Code. I was just as excited because I had never been enthusiastic about anything remotely related to math so to find a modicum of success at coding was a big deal to me. The math coach felt the same. She liked that we had events in most of the schools in the district and had shared resources with teachers. She was doing it on her own. We had a good conversation right there in frozen foods section of Wal-Mart. The feeling was back. I had a connection with someone. Something I had shared sparked an interest. I felt like a teacher again. Nevermind that the woman and I had been colleagues for seven years. I shared something with her that she was unfamiliar with, and it sparked a desire for further study. Because I am the kind of person I am, I have thought a lot about not teaching students anymore. Yes, my students are finishing high school this year. They will go on to college, technical school, the military, or the workforce. Unless they fall off the face of the Earth, I will no doubt have some contact with them. There is Facebook, Twitter, and even Wal-Mart. In a town like Griffin, you see everyone in Wal-Mart. Usually when you look less than your best, but that’s okay because it’s Wal-Mart. I will see a former student or their parent or get connected with them via social media. We will talk, and I will realize that the connection is still there. It will be different, but it will still be there. The same will be said of the teachers I work with. Our relationship will change over time, but we will still learn from each other, and I will know that I continue to make a difference. I also know that the learning will never stop. The cycle will continue. I’m not a morning person. I am a middle of the day kind of person; however, as far as the school day is concerned, my favorite part of the day is the beginning. I know that goes against who I am as a person, but the beginning of the day is a brand new day. Whatever not-so-nice stuff I said the day before is done and over with. I can move on, and the students can move on. From time to time I say not-so-nice things. Not often, but sometimes. A new day means that the students can start fresh. When they come in the room, I am at the door to greet them and get them started on a new learning adventure or a continuation of the adventure from the day before. A new day means that if they did not understand the day before, there is another opportunity to master the content. A new beginning means they have another chance at almost anything and everything. As an instructional technology coach, I still feel the same way. I like the beginning of the day. When everything works for me in the morning, I am able to get up and out of the house soon enough so that I can get to the office and have a few moments of quiet time. I like to have time to think about what needs to be done for the day and make a plan. I like anticipating what is to come. My days are very different although I do the same thing at each school. The teachers are different, their readiness levels are different, and their expectations are different. I like having time to mentally prepare for what’s ahead. I like the quiet of the morning and having time to watch the day unfold. It’s pretty awesome if you think about it. I also like getting to work before the others so I can get a good parking space.